Crystal Cruises has come to the rescue of the historic luxury liner SS United States, announcing plans for an exclusive purchase option agreement to begin work on returning America’s flagship to seagoing service, pending a technical feasibility study. Launched in 1952 as the fastest, largest and safest passenger liner in the world, “Big U” was regarded as an American symbol of elegance and technological prowess, capturing the transatlantic speed record on her maiden voyage and transporting more than one million passengers over her lifetime, including four U.S. presidents, international royalty and countless Hollywood celebrities. Still the largest passenger ship ever built in America (and still the fastest cruise liner to cross the Atlantic), the ship is the brainchild of renowned naval architect William Francis Gibbs, who designed the SS United States as part of the U.S. government’s secret Cold War era program that called for a high-tech passenger liner that could to double as a naval troopship in the event of war. As designed it could carry, if needed, 15,000 troops rapidly around the globe courtesy of a 240,000 shaft horsepower propulsion plant capable of traveling nearly halfway around the world without refueling. Despite her celebrated innovation and grandeur, the ship has spent years mothballed at dock in Philadelphia in an escalating state of disrepair, last sailing under her own power more than 40 years ago. The SS United States has seen a number of developers attempt to answer her SOS call since retiring from service in 1969. 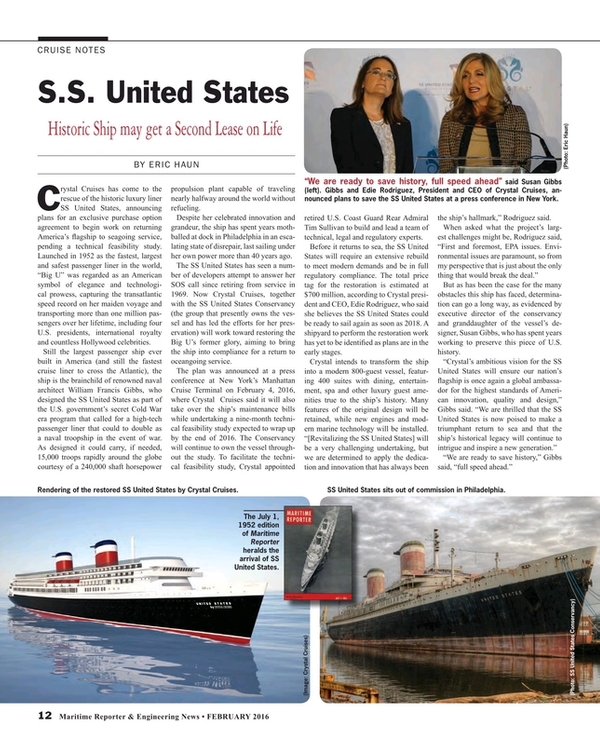 Now Crystal Cruises, together with the SS United States Conservancy (the group that presently owns the vessel and has led the efforts for her preservation) will work toward restoring the Big U’s former glory, aiming to bring the ship into compliance for a return to oceangoing service. The plan was announced at a press conference at New York’s Manhattan Cruise Terminal on February 4, 2016, where Crystal Cruises said it will also take over the ship’s maintenance bills while undertaking a nine-month technical feasibility study expected to wrap up by the end of 2016. The Conservancy will continue to own the vessel throughout the study. To facilitate the technical feasibility study, Crystal appointed retired U.S. Coast Guard Rear Admiral Tim Sullivan to build and lead a team of technical, legal and regulatory experts. Before it returns to sea, the SS United States will require an extensive rebuild to meet modern demands and be in full regulatory compliance. The total price tag for the restoration is estimated at $700 million, according to Crystal president and CEO, Edie Rodriguez, who said she believes the SS United States could be ready to sail again as soon as 2018. A shipyard to perform the restoration work has yet to be identified as plans are in the early stages. Crystal intends to transform the ship into a modern 800-guest vessel, featuring 400 suites with dining, entertainment, spa and other luxury guest amenities true to the ship’s history. Many features of the original design will be retained, while new engines and modern marine technology will be installed. “[Revitalizing the SS United States] will be a very challenging undertaking, but we are determined to apply the dedication and innovation that has always been the ship’s hallmark,” Rodriguez said. But as has been the case for the many obstacles this ship has faced, determination can go a long way, as evidenced by executive director of the conservancy and granddaughter of the vessel’s designer, Susan Gibbs, who has spent years working to preserve this piece of U.S. history.